It was lovely being back at the wonderful Houchins Farm, Coggeshall for the wedding of Laura and Jon. 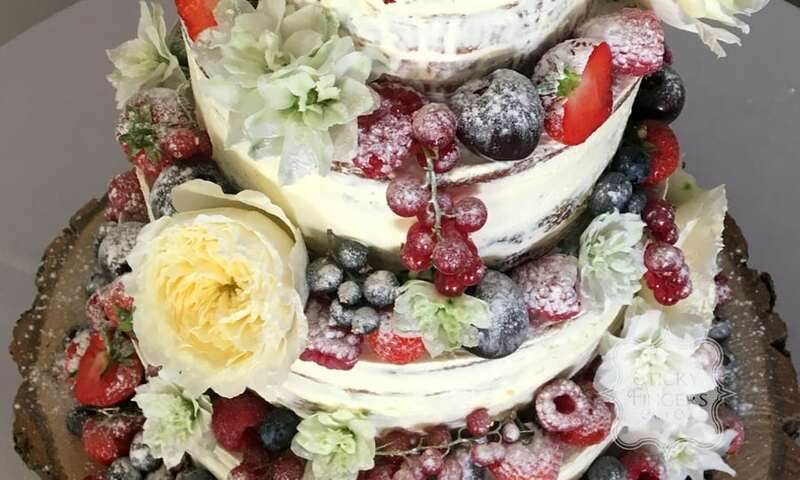 I was asked to make a 4 tier semi-naked wedding cake to be decorated with fresh seasonal berries and fresh flowers supplied by their florist Jade Flower Design – www.jadesflowers.co.uk – I was delighted to see I was supplied with one of my favourite flowers, “Patience” David Austin Rose, to decorate the cake with. Their smell was sooooo yummy! They chose four different flavours for their cake which were lovely lemony lemon cake, strawberry and Champagne, salted caramel and lastly white chocolate and passion fruit. I have to say, Laura and Jon’s cake is one of the loveliest I’ve made once I’d finished decorating it, probably due to the fact I’m a sucker for the amazing David Austin roses! Many, many congratulations to Laura and Jon. I hope you had an amazing day!